This is not your average fried rice! Another one of Phil Hickerson’s specialties learned from Tojo Yamamoto, this fried rice is loaded with plenty of veggies and extras. Serve it as it is for an extra special side dish or add some stir fried chicken, pork, or shrimp to create a flavorful one dish meal. Soy sauce is what gives fried rice it’s trademark golden brown color. If you happen to add too much soy for your taste, simply add more rice. 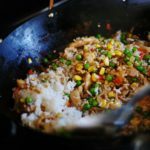 This hearty fried rice is delicious on its own or with chicken, pork, or shrimp as a meal. 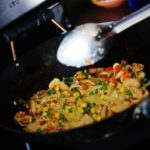 Add 2 Tbsp cooking oil to wok or deep sautee pan and heat on stove top on medium high heat. Add bacon, cooking just until soft. Add carrots and onion. Stir fry one minute. Add mushrooms and water chestnuts. Stir fry until mushrooms begin to shrink. Add corn and peas. Stir fry for 1-2 more minutes and veggies are crisp tender. Toss with 2-3 Tbsp soy sauce. 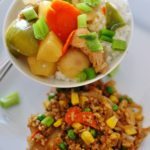 Using minute rice is a great way to make the prep for this dish easier! To read about Phil’s visit to my kitchen and his ‘Down for the Count’ Pineapple Chicken recipe, click here.